November is National Adoption Month focusing on a different theme every year to raise awareness about the need for adoptive families in the United States. 2010’s theme is “You don’t have to be perfect to be a perfect parent” and aims to recruit and retain parents for the 115,000 foster children and youth who are waiting for adoptive families. Families come in all different shapes, sizes and varieties, and November is a good opportunity to teach your children about adoption (no matter what kind of family you have). Over a year ago, we were inspired here at Frecklebox by some of our customers who had just adpoted a child and wanted a personalized book to read to her. 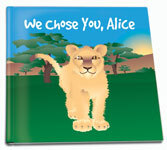 We wrote the book “We Chose You,” to explain to the child how fortunate the parents were to have found her. There are several outstanding children’s books about adoption, here are some that show a few of the diverse ways a loving family can be formed. Five-year-old Ethan is celebrating the first anniversary of his adoption by his foster family. As the day progresses, he looks through his “lifebook” and thinks about his birth family and happily observes the special occasion with his adoptive family. Families can be big, small, messy or clean. Some families include stepmoms, stepdads and stepkids; others have two moms or two dads or one parent, and still others adopt children. The Family Book is a fun, playful take on all different types of families. Ada, a Chinese-American girl, tells the story of why she has three names: one close to her heart given by her mother, one used when she lived in an orphanage and one given to her by her adoptive parents. Three Names of Me honestly captures Ada’s feelings about her past and present. A little girl begs her parents again and again to tell the story of the night they got on a plane to adopt her and bring her home: “Tell me again about how you would adopt me and be my parents… Tell me again about the first time you held me in your arms…” It is a humorous, whimsical story full of love and emotion. Rosie is a beagle who has been adopted by a family of schnauzers. She notices she doesn’t look like the other members of her family and asks questions that adopted children may have as well. It’s a sweet, relatable story with colorful pictures and a helpful discussion guide at the end for parents. This story gracefully addresses some of the tough emotions and themes associated with foster care and adoption. Zachary is a kitten who is taken from his mother when she can’t care for him, then enters foster care and is eventually adopted by a loving family of geese. Zachary experiences a range of emotions, from confusion, sadness, fear and anger, until he finds happiness with his adopted family. Have you read any children’s books about adoption with your family? Which would you recommend to other parents?